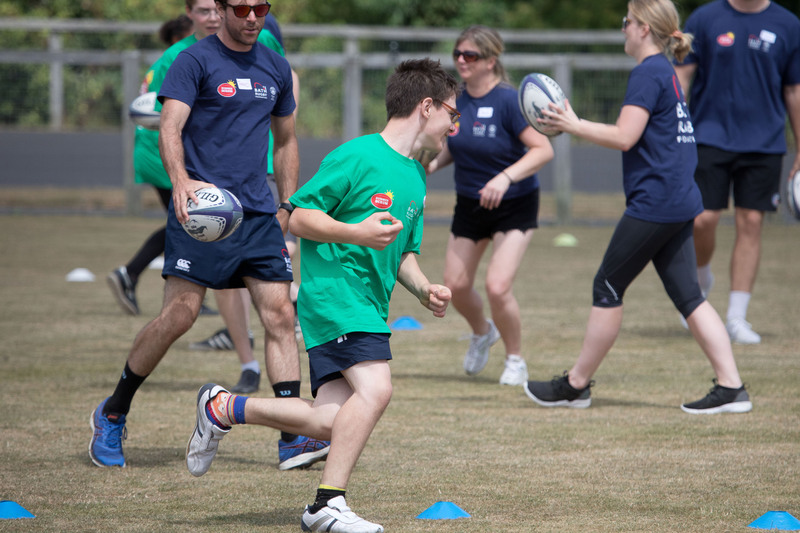 More than 140 young people with disabilities and special needs were given the chance to play rugby with star players and coaches at Bath Rugby Foundation's biggest ever Summer Scrum Festival. The mixed ability rugby festival saw children invited from four local SEND schools that the Foundation works with all year round as part of their free, inclusive Hi5! Sports clubs. They took part in rugby-based games and activities and got the chance to cycle on specially-adapted bikes – all assisted by academy and first-team stars such as captain Matt Garvey and Welshman Taulupe Faletau. The event was organised by Bath Rugby Foundation's senior coach Becks Toan. She told ConnectSport: "As a coach my aim with every child is to tackle a barrier and create a memory. Often the barrier is that they think they can't do it. When they do it, it creates a memory which then has huge lasting effects on them. "It improves their confidence and makes them think about things differently. It makes them look forward rather than being negative. It's really special to see their faces. "It's just a really fun, inspirational day where if you don't walk away with a smile on your face or a tear in your eye, there's something wrong with you! It gives you a real sense of why you do the job and why you give 100% every day." The festival is a celebration of the Foundation's all-year-round work with disabled and SEND children and young people, which is part of the Rugby Football Union and Premiership Rugby's 'Project Rugby' programme. Bath Rugby Foundation have recently established the first mixed ability rugby team in the south west, Walcot Warriors, and from September two coaches will be taking the reins and leading them into fixtures against similar teams from across the UK. "We're opening the doors for rugby to be accessible for everyone," said Becks. The Foundation additionally runs Hi5! Outreach and Inclusion Active, which both give adults with disabilities the chance to access sport. Another project, 'Breakthrough', offers sport and mentoring support to 16 to 18-year-olds with learning difficulties and/or disabilities who are not in education, employment or training.